A fabulous meal in itself, or a lovely accompaniment to roast pork. Any leftovers are great the next day, too. 1. Preheat the oven to 200˚C, gas mark 6. Toss the squash, onion and apples with the honey, herbs and 2 tbsp olive oil; season. Spread in an even layer on a large roasting tray and bake for 30-40 minutes, turning halfway, until soft and slightly golden. 2. Meanwhile, cook the farro according to pack instructions until al dente. Drain well and keep warm. 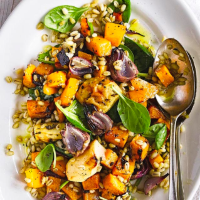 Toss the spinach through the warm roasted vegetables to wilt slightly, then stir through the farro. Whisk together the vinegar, maple syrup, mustard, garlic and remaining 2 tbsp olive oil, then toss through the salad before serving.